Mujahidul Islam was a 3rd year student of BBA at Stamford University. He was the President of Bangladesh Islami Chhatra Shibir, Mirpur 10 unit of Dhaka. 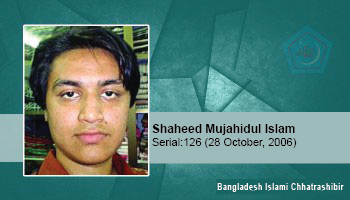 On 28 October 2006, Awami League activists killed Mujahid by beating with sticks and oars. They severly tortured him by indiscriminately beating him with blunt and sharp weapons on his hands, nose, legs, head, mouth. 14 party alliance activists killed Mujahid so cruelly, it brought to shame barbaric practices of the Dark Ages of the Medieval period. After ensuring Mujahid’s death, the killers danced on his dead body under broad day light. Place of martyrdom: Baitul Mukarram. He was injured in Awami League led 14-party attacks on the Northern gate of Baitul Mukarram and he attained martyred at Islami Bank Hospital.